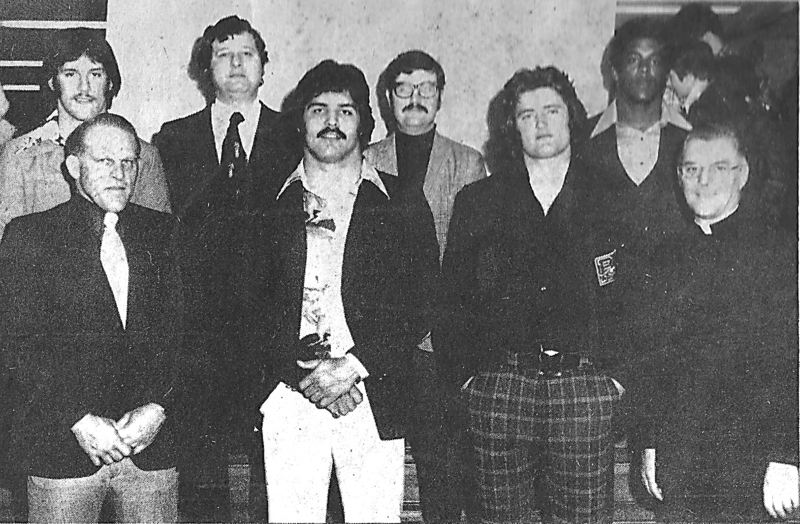 Headed by Tony Dorsett, the University of Pittsburgh helped highlight the All Sports Banquet at Seven Sorrows Church Hall in the spring of 1976. Front row from left are Middletown football coach Dave Yohn; Al Romano, All-American noseguard from Pitt; Jim Corbett, all-east tight end, and the Rev. Andrew Marinak of Seven Sorrows Church. In the back row are Matt Cavanaugh, first string quarterback at Pitt; Dr. Mark Cackovic, who was instrumental in getting the Pitt athletes to the banquet; Ed McConnell, banquet toastmaster; and Tony Dorsett, three-time all-American running back. It was a clear, cool evening in mid-October. The scene was the 8 yard line near the north end zone at Middletown’s Memorial Field. The team was pushing toward the Acme where Aaron’s is now located in the Giant Plaza. JS the QB takes the snap and hands it off to TB. TB grabs the ball and is taken down three yards into the end zone. Touchdown! Now they are lined up to go for two. Once again, QB JS hands off to TB, but he gets hit real hard and fumbles. Suddenly the ball was on the ground in front of JT and it looked as big as a beach ball. JT dives on top of the ball and gets crushed by two defenders, but the two-point conversion is good! This was not just another touchdown. This was the only touchdown and two-point conversion that the Seven Sorrows Eagles Pony team scored that entire season. The year was 1975. Father Andrew Marinak, our pastor, had finally gotten a football program started. The quarterback was John Sheaffer. Running back TB was Tim Brought (Bishop McDevitt, Class of 1980) and yours truly was tight end JT (McDevitt, 1980). Our coaches included Sol Swartz, Ron Matinchek and Dr. Kolley. As you can imagine, starting a football team from scratch was tough. The coaches did the best they could to prepare us, but each game was like war against a well-schooled and seasoned army. Most of us had never strapped on a helmet before. Starting a football program from scratch was an intense life-learning experience. My dad Andy understood that I was not built for football and that I was more suited to play baseball and tennis. He did like the fact that there was a summertime conditioning program to get us into shape for the fall. But he pulled me aside and said: “If you sign up you are not going to quit.” This turned out to be one of his best lessons that he taught me. I still have my trophy. It was not an award for winning, it was a reminder and a thank-you for staying with the program until the last game. They even had a banquet for the Seven Sorrows basketball and football players. They brought in Tony Dorsett (who would win the Heisman Trophy later that year, 1976) and Matt Cavanaugh (promoted this week to offensive coordinator of the Washington Redskins) from Pitt. It was great to meet these contemporary sport legends in the same cafeteria where we ate Sloppy Joes and thousands now enter to enjoy our fish fry. Let’s fast forward to the recent months of football triumph for Middletown. The Blue Raiders had an amazing season. I was sitting at mass at Seven Sorrows when Father Ted Keating pointed out the happiness and pride of our community for the Blue Raiders playoff run right up to the edge of winning the final to become state champions. I ran into Mark Shipkowski, who informed me that the Blue Raiders had a solid contingent of Seven Sorrows Eagles on the team. It brought a smile to my face. The program that we started years ago had truly flourished. It was great to have the Seven Sorrows Eagles win the championship at their level as well! The competition in the Catholic Youth League is always intense. Congratulations to these young players and to their coaches and parents. I’m a big Pittsburgh Pirates fan but was too nervous to watch Game 7 in the 1971 World Series when the Bucs beat the Orioles. Where was I? Playing two-hand touch football with a group of friends next to the Jednota swimming pool. I was way too small to play, so they made me and my friend John Lucas the centers. Hey, we got to snap the ball every time and they found out that we could run a route and pass to us as a safety valve. These games taught us the basics of football, teamwork, and they kept us off the couch and outdoors running and breathing fresh air. These pickup games are missing in the lives of too many of our kids. They need to be encouraged. They build up fantastic memories and cost almost nothing to take place. This was pickup football. A group of neighbors and friends who met, choose up sides and played for the fun of it. The final score is not as important and the quality time of playing, imagining being a professional athlete and enjoying the chance to be alive and kicking. The pickup experience in certain areas is getting pushed under by a huge increase in organized sports and traveling teams. Soccer was barely starting back in the 1970s and no one even heard of lacrosse. But both of these sports are taking up youth football fields. You can’t forget the allure of today’s video games, either. They are much more interactive and realistic than my Joe Namath Electric Football Game. Next up is the wonderful turnaround with the Penn State Nittany Lions. It is such a pity that the horrible actions of one coach, Jerry Sandusky, turned into punishments to so many students. Penn State is back, which is a good thing for Pennsylvania! So where is football headed in the future? That is a good question. The biggest concern going forward is highlighted in the movie “Concussion.” Are we going to need huge helmets like the characters wore in Mel Brooks hit movie “Spaceballs”? The NFL is slowly addressing head-to-head hits and concussion protocol, but they are decades behind on this issue. And then there is mom, dad and the rest of the family who may decide that football is just too dangerous. Injuries from the game are one thing, but permanent brain damage is a much bigger issue. Pennsylvania has its two NFL cathedrals with Heinz Field for The Steelers and The Linc (Lincoln Financial Field) for the Eagles. The Ravens are a short drive into Maryland as well. Sellouts at all three are common but less so in cities such as Jacksonville and Cleveland. The NFL is a huge economic engine. I have a huge poster in my woodshop put out by DirecTV that has a block for every NFL game that season. Beyond the tickets and the food and beverages at games, factor in the money spent on tailgates, gas for travel, hotels and NFL wearables. Then there are forces — some of whom are just envious “good-doers” who don’t even know about the sport —who want football banned and eliminated for a variety of reasons. I do not see them succeeding, but they are out there. My hope is that the game continues to move forward with improvements toward player safety, and that friends and family continue to gather to watch all ages play the football in organized leagues. I dream that a new generation of kids head out the backdoor, hop on their bikes, ride down to side field at Oak Hills or Little Hollywood Park in Lower Swatara, choose up sides, run some routes, fall down and get dirty, and build memories to share with their kids. During my first visit to Heinz Field to watch the Steelers play the Cleveland Browns, I sat high in the end zone and saw the Ohio River in the distance. Then I looked down and saw the gridiron as a chess board in front of me. As Big Ben Roethlisberger dropped back for a pass, my mind dropped back to playing pickup football with the Bosnaks, Mosers, Krasjas and Magaros, Johnny Lucas and the others at Jednota. It truly was the same game, just on a much bigger scale. None of us Jednota athletes made it to the pros, but almost every pro learned something about the game by choosing up sides and playing pickup football until they were called in for dinner. Joe Trojcak is the owner of Progressive Enterprises Sound Studios in Elizabethtown. He gives motivational presentations to encourage career building and entrepreneurship under the title “Fire Up Now.” Reach him at joet@progressivestudios.com.